A glance at their brochure describes highly energy efficient timber frame building systems which are customisable and uses solar energy to generate most of their own electricity. A Mechanical Ventilation and Heat Recovery (MVHR) system warms fresh air by capturing heat from the exhaust air from the house. A smart home gives you intelligent control over your home heating, improving comfort and reducing your bills. You can then also choose from a selection of tech system upgrades including the ability to control the systems from your smartphone or tablet. 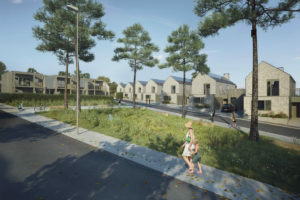 HAB Housing also focus on the environment outside the homes themselves to ensure the landscape, sustainable water management and ecological features of Lovedon Fields complement each other beautifully. Lovedon Fields is a development by Kevin McCloud’s HAB Housing; for those of you that haven’t heard of HAB housing, it stands for Happiness, Architecture & Beauty. Kevin of Grand Designs fame was looking to challenge Self-Build housing schemes in the UK. They financed the HAB expansion and brought 650 new investors into the business through a world record crowd fund in 2013. The crowd-funded self-build plots would be used for homes which are cheaper, greener, more spacious and “more beautiful” than the uniform houses churned out by high-volume developers. 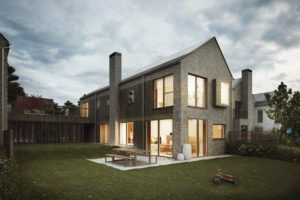 With the focus in the UK of building more affordable and sustainable homes we are watching with interest to see how successful Lovedon Fields is. We will be sharing some more of our in-depth thoughts on smart homes and sustainable building so don’t miss out by signing up to our newsletter.